No one buys a 49-inch curved ultrawide monitor because they need one. No. This is about extravagance. This is about luxury. This is about hubris. 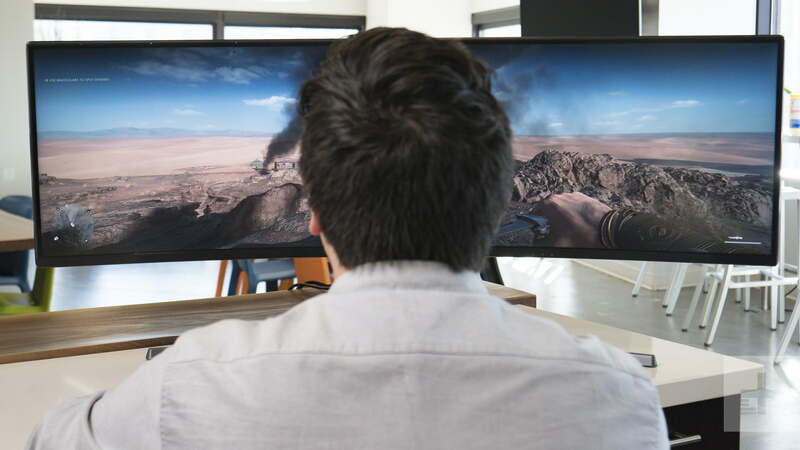 If you have a craving for the excessive — or perhaps just a spark of curiosity in your mind about what it might be like to game on the world’s widest ultrawide gaming monitor — the 49-inch Samsung CHG90 must be seen to believed. 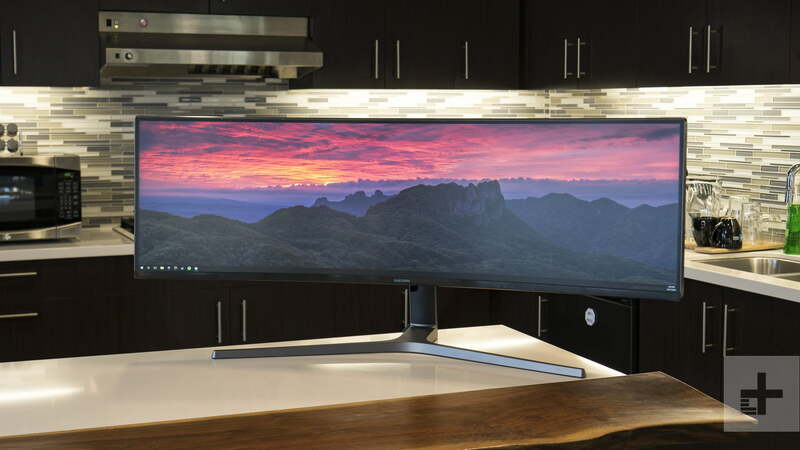 Curved, ultrawide monitors could have been just a fad, but instead they just keep getting larger and more exciting. 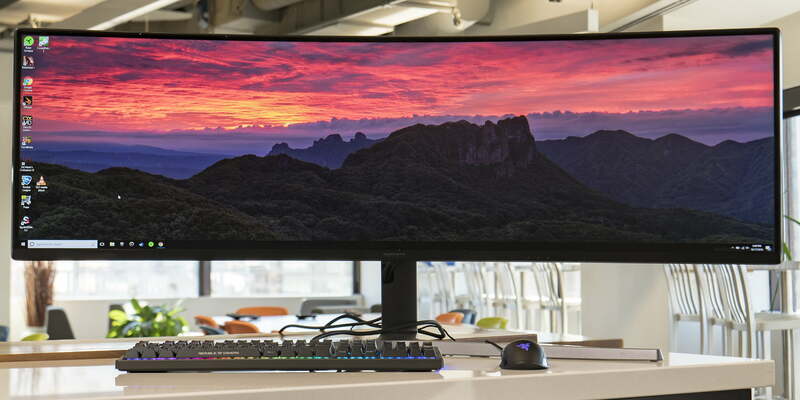 The CHG90 feels like the pinnacle of that development, stretching out to an ungodly 49-inches wide. It looks like something that belongs on the bridge of the starship Enterprise. We had it set up for weeks in the office, yet every day someone new stopped to gawk as they walked by. Who can blame them? It took up nearly the entire width of a desk. The base is large as well, dominating the surface and leaving little room for a keyboard, mouse, or laptop. What’s the benefit of its size? You can open multiple browser windows, or applications, full screen side-by-side. The experience of using the CHG90 isn’t unlike a dual 27-inch monitor setup — just without the divider in between. But the CHG90 isn’t merely for productivity, though it’s great at that. This thing is a tried-and-true gaming monitor. As we learned, a screen this large offers big advantages in games. When sitting at the center of the monitor’s curve, your field of vision is closer to that of the natural human eye. It’s not virtual reality, but it’s the next best thing. 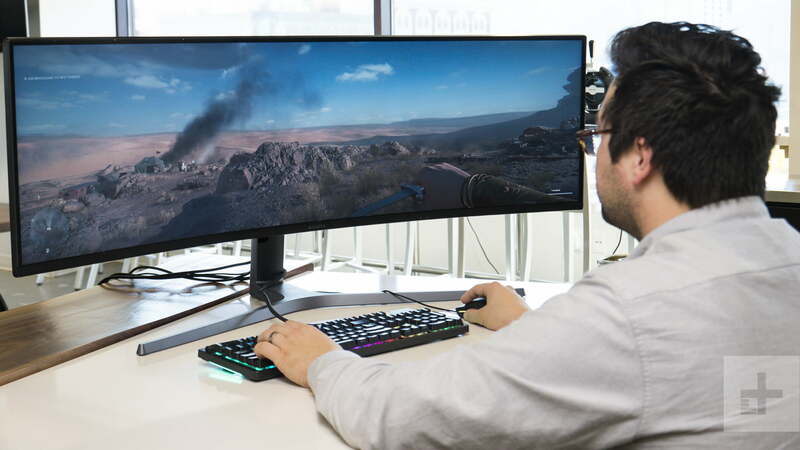 It looks beautiful and can give you a competitive edge, as you can see an enemy sneaking up beside you in Fortnite or gain a broader view from your sniper’s nest in Battlefield V.
The 1800R curve matches what you find in monitors like the BenQ EX3501R. It provides just the right viewing angles when you sit right in the center of the monitor, and looks downright futuristic from behind. The base, stand, and case are all made of plastic, but it’s durable enough hold up the 26 pounds of pixels from falling forward. And while you won’t need to do much swiveling and tilting given this monitor’s size, but Samsung still provides an adequate amount of height, swivel, and tilt adjustment. A comfortable viewing angle is easy to find. The ports, pointed down beneath the display, are a bit hard to reach, though they keep your desk looking clean. Connections include USB-A, DisplayPort, mini-DisplayPort, and HDMI. USB-C unfortunately isn’t available. 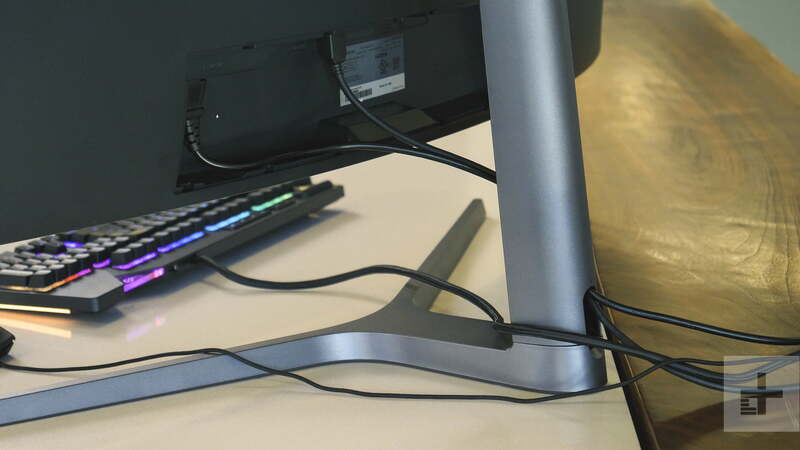 Newer monitors like the Dell UltraSharp 4K 32 provide a simpler single-cable that can power a laptop while also extending the laptop’s screen to the monitor. Meanwhile, the menu system is a bit confusing. The three physical buttons provide quick access to some gaming profiles where you can have features like FreeSync, response time, and black levels automatically adjusted. A joystick on the right gives you access to sharpness, contrast, brightness, and volume. It’s not as expansive of options as what you’d find on something like the BenQ EX3501R, but it has the basics covered. While we prefer intuitive menus, Samsung at least provided quick access to brightness by pressing up or down, and volume by pressing left or right. Don’t forget which is which, though – they aren’t clearly labeled. The CHG90 could have been a gimmick. Fortunately, it has a panel worthy of taking over the entirety of your desk, and we saw that in our imaging tests. Whether it’s contrast ratio, color accuracy, or color gamut, the CHG90 leads the pack. For gaming-focused monitors, it’s common to see narrow color gamuts or color accuracy in favor or big, splashy features companies can easily market. Instead, Samsung delivers the goods in image quality. Everything it shows looks sensation. It’s not the brightest monitor in the world, however, peaking at 286 nits. That’s an area where monitors like the BenQ EX3501R or HP Z38c fare a bit better. After calibrating the screen, we didn’t see a major change in image quality. There’s a long list of tech that can be packed into a monitor. 4K? HDR? 144Hz refresh rate? G-Sync? Those are all important features that can affect how games feel and play. The CHG90 offers three out of the five: A 144Hz refresh rate, support for HDR, and a one millisecond response time. It all works to make games look incredible. Battlefield 1, which supports HDR, was a particular highlight, offering an awesome sense of depth and contrast that made the game look similar to a 3D image. While HDR on Windows 10 is still an ugly affair, certain games benefit hugely from it. Resolution is the monitor’s only weakness. It offers 3,840 x 1,080 which, when spread out across this 49-inch monster, is the same pixel density you’d find on a 27-inch 1080p screen. Individual pixels are noticeable if you look closely, and that can detract from the monitor’s overall beauty. You’ll notice it most in games with high-contrast graphics, or games that don’t have great anti-aliasing options baked in. It should also be noted that G-Sync isn’t available on this monitor. It’s a feature made to prevent screen-tearing on Nvidia graphics cards, but it often adds hundreds of dollars to the price tag of a gaming monitor. Because many gamers are willing to pay the extra price, we wish Samsung would provide a G-Sync option. As of now, only AMD cards will benefit from the FreeSync support this monitor includes, and AMD video cards are much less popular among PC gamers. That’s in contrast to displays like the LG Ultrafine 5K or the Dell Ultrasharp UP3218K, where we saw sharp increases in color accuracy after calibration. A thousand bucks is a lot to spend on a monitor but given the other monitors that sell for around the same price, such as the HP Z38c or the LG 38UC99-W, Samsung’s 49-incher feels like a good deal. It’s among the most impressive monitors we’ve ever used. Not yet. 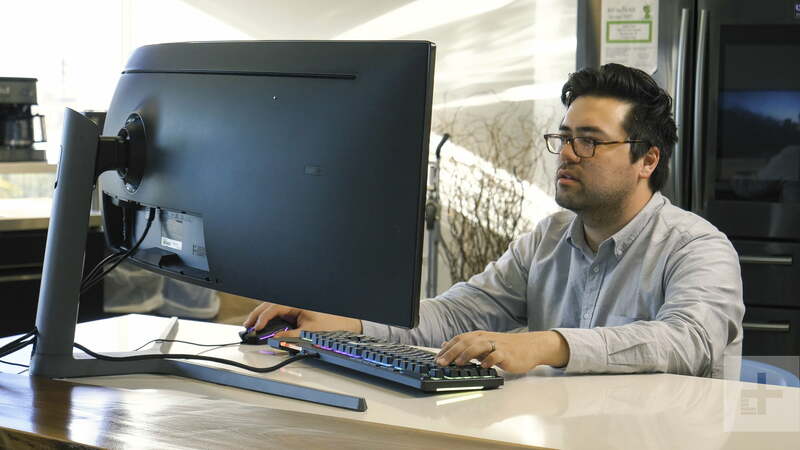 Samsung’s 49-inch monitor is as large as they come, and with how well they did it, it may be king of the hill for quite some time. There are some great 38-inch monitors out there, though the extra eleven inches puts this in an entirely different category. Dell recently introduced a similar 49-inch monitor with a better 1440p resolution, though it’s $600 more expensive and isn’t a gaming monitor. It’s also not currently available. 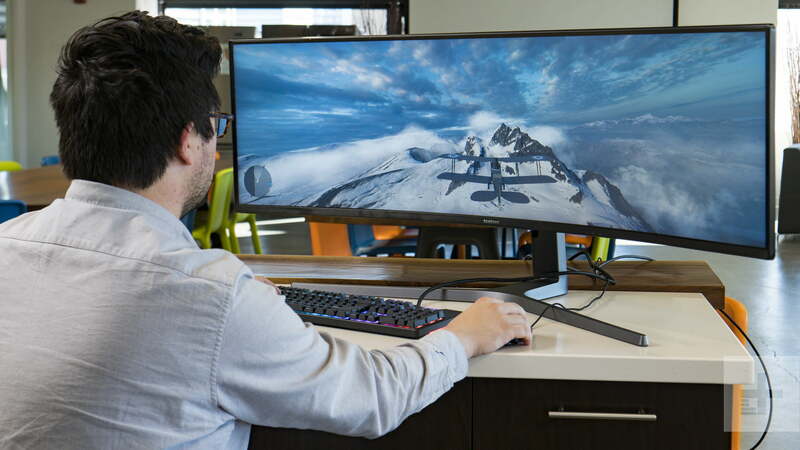 This 49-inch monitor is fit to sit on your desk for many years. It’s built well and is ahead of its time in terms of size. The monitor comes with a parts and labor warranty that lasts for three years, which is standard for expensive monitors. Yes. If you’re ready to spend a grand on a monitor, why not go big?